Thanksgiving is a week away which means now is the time to start gathering those recipes and figuring out what dishes you’ll be cooking in the kitchen on the big day. Whether you are making a full blown Thanksgiving spread or just a few dishes to take over to a friends, Homemade Green Bean Casserole is one recipe that is sure to please a crowd. Nowadays it is all about the quick and easy for convenience sake but did you know that making green bean casserole from scratch is just as easy as using pre-packaged products. Let’s ditch the canned stuff this holiday season for real ingredients and get back to our roots of creating homemade recipes in the kitchen. 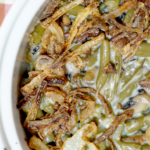 When it comes to making green bean casserole from scratch you may be surprised to learn that you can create cream of mushroom soup and french fried onions at home. Sure opening the seal on a can is going to be an easier and a time saving method when you need to make a meal fast but there is a specific taste and sense of pride when making it yourself that can not be purchased from a store. While store bought ingredients do have their time and place when looking for a quick cooking solution, with a little extra effort and a few more minutes in cooking time, you’ll be amazed at how easy making your favorite dishes from scratch can be. Ditch the canned stuff for this delicious, completely from scratch green bean casserole recipe. Your classic green bean casserole recipe gets a makeover using fresh, real ingredients for an authentic homemade taste. First slice the mushrooms. Then to slice the onion. First peel the onion. Then cut the onion in half. Place the onion cut side down and cut each half of the onion into thin strips. Half the strips as one half will be used for inside the green bean casserole and the other half will be fried for a french fried onion crunchy topping. In a skillet, melt butter on medium-high heat. Add sliced mushrooms and half of the sliced onion. Cook until mushrooms begin to brown and onions are translucent in color. Sprinkle mushrooms with salt and pepper. Then in a measuring cup whisk together the milk, cornstarch, and soy sauce. Once combined, pour mixture into skillet with mushrooms. Stir well. Stir regularly until the mixture begins to thicken like a soup. Once thickened, turn off the heat and stir in the green beans until coated. Set aside. Fill the bottom of a skillet with oil (vegetable, canola, or peanut) for frying your onions. In a bowl toss half of the sliced onions with flour until coated. Heat on medium-high. Once the oil is hot, add the floured, sliced onions. Cook until slightly brown in color. Do not brown the onions too much at this point as they will brown a bit more in the oven. Remove fried onions from skillet and allow to drain on paper towels. Set aside until ready to top your green bean casserole. Preaheat oven to 450° F.
In a greased baking dish, add the green bean mixture we made earlier. Bake the green in the oven for 15-20 minutes or until the green bean casserole is bubbling. Remove from oven and sprinkle the top with the french fried onions we made earlier. Return back to the oven to bake for an additional 5 minutes or until onions have crisped up and browned a bit more. Allow to sit for 5 minutes before serving. Note: this recipe can be doubled or tripled to feed a crowd. I love the way that this recipe turns out. It makes just the right amount for any weeknight or Sunday family meal but it can also be doubled or tripled to feed a large crowd on Thanksgiving. Once you learn to make green bean casserole from scratch you won’t want to go back to the canned version, I’m sure. Have you ever made green bean casserole from scratch? I LOVE a good green bean casserole and this one looks and sounds delish! I’m from the Midwest and ours were very similar to yours growing up – yum! Yum! I’ve never had a bean casserole before this looks delicious and easy enough for me to make! I will have to give it a try! I just was retested for my allergies and so happy to hear I can eat green beans again. This looks yum. Yes, I think you could use a plant based milk in this recipe instead. Looks delicious! Seems the very thing to eat on a cold Christmas day! I’ve never made any kind of green been casserole before. It’s not something I grew up eating, but this does sound yummy. OMG! This looks amazing and really tempting. I would definitely try this Southern Green Bean Casserole for my family, they will love this for sure. I just pinned this! It incredible!! Green bean casserole is definitely a staple food around Thanksgiving! I am not typically a fan of green bean casserole, but your recipe almost makes me want to change my mind! I’m going to check out some of your other recipes while I’m here. I have never made a casserole let alone a green bean casserole but this recipe is making me so hungry. I really want to try this out! This recipe is one of my absolute favorites both for the holidays and for an everyday meal! I love the flavors, and the textures! I love the idea of making my own French fried onions, I have never done that before, I usually just buy a can of them, I must try this, looks so good! Oh yum!!! Green been casserole is a must have for holidays! I’m gonna have to try out this recipe! I have never had green bean casserole before but i imagine it must taste amazing. Can’t wait to try it . We lived in Georgia and north carolina for a few years, so I think it’s our obligation to make this! I’m not sure if I’ve actually had 100% homemade green bean casserole, but it looks really good! We have this every year. I have not made it myself yet though, and I really should give it a whirl. I have not made green bean casserole myself but have had some at some thanksgiving dinners and it was good. It is always a crowd pleasure for sure. Green bean casserole is such a staple for the holidays! I need to start making it for my family. I have not made green bean casserole before, it looks and sounds so delicious. I am going to try it out in the Christmas holidays. This looks and sounds amazing. I love a good casserole in the winter, it makes up for the cold weather. I don’t do dairy, so I’ll swap butter and milk for non-dairy. I love that you are frying your own crispy onions! Yum! This sounds so delicious! If this was served at our Thanksgiving table, I would definitely put heaps on my plate! This is one of my favorite dishes to both make and enjoy. This looks like it is so good. 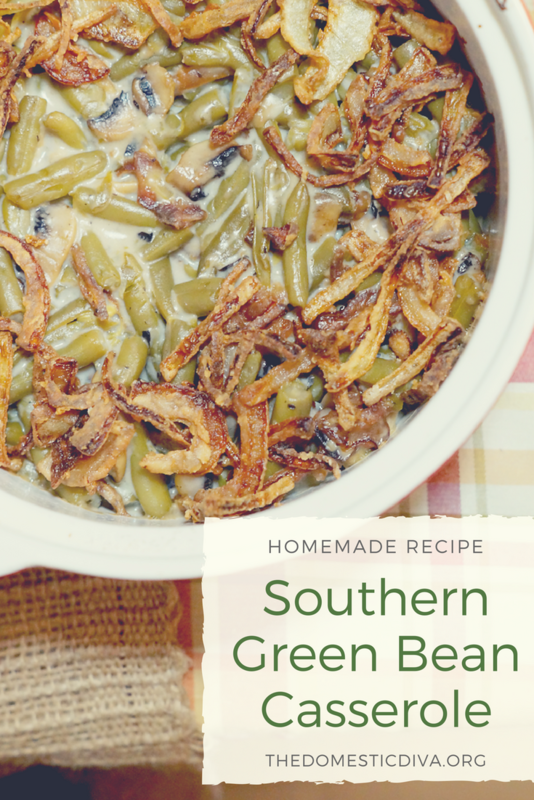 Looks like an easy yet delicious southern green bean casserole! Perfect for this week! This looks tasty! I just got an idea what to make for lunch, thank you! Yummy!!! this looks very tasty! thank you for sharing the recipe! This recipe sounds amazing! Yum.